This month’s strategy is the Routine. This routine provides a structure for students to engage in an investigation, inquiry, or experimentation. Predict: What do you think will happen? Gather: Carry out your investigation, inquiry, or experiment and collect data, information, and evidence as you do. Explain: Review your data to build an explanation for why things happened as they did. Look for this routine in the upcoming book Making Thinking Visible 2.0 by Ron Ritchhart. The PG & E Routine will be added to the RCSThinkfromtheMiddle website. Please share with me your use of this routine as I would love to be able to add your student work samples, videos, and reflections as well to enhance our website. Please contact me if I can be of help to you in designing your lesson, or if you would like to be added to the website in some way (student samples, videos, reflections). I look forward to working with you. Since it will be a new strategy that is not currently on the RCSThinkfromtheMiddle website, I will be seeking teachers who would be willing to participate in testing out the strategy in the classroom with students in order to add sample student work as well as videos and teacher/student reflections on the website. This month’s strategy is the Protocol. This routine may sound familiar because last school year on 3/14/17, we used this routine in PD in order to look at our teaching practice. It is not believed that this routine has been officially released by Ron Ritchhart, but will more than likely become a part of one of his upcoming books. SAIL is an acronym for Share, Ask, Ideas, Learned and is used as a discourse method to solicit input from others. It can easily be used in STEM, Genius Hour, project-based learning, and even writing conferences. Please see the attached document that fully explains the protocol for the routine as well as some helpful hints when using this routine. The SAIL Protocol will be added to the RCSThinkfromtheMiddle website. Please share with me your use of this routine as I would love to be able to add your student work samples, videos, and reflections as well to enhance our website. Each month I will be highlighting one new learning strategy and will share it via email to all staff. It is my hope that you will add it to your teaching toolbox and test it out in the near future. EXCITING NEWS!!! Just two days after the October Strategy of the Month was emailed out, Ann Prashar used the +1 Routine in her lesson as an ideal way for students to take in a 10 minute video and then recall the most important ideas/concepts for future reference. The lesson was videotaped for inclusion on the RCSThinkfromtheMiddle website, and it will include a teacher reflection as well about the use of the routine. Look for it soon! This month’s strategy is the E3 Routine. This routine provides a structure for students to investigate possible processes or steps in order to solve a problem. The routine makes sense for the math classroom specifically, but there may be additional ways that it can be applied to other subject areas. Math teachers may choose to pair the routine with some of the lessons and activities that can be found at “Estimation 180”. There are many other visible thinking ideas shared on that website as well. Please see the attached document that fully explains the protocol for the routine as well as some helpful hints when using this routine. The Routine will be added to the RCSThinkfromtheMiddle website. Please share with me your use of this routine as I would love to be able to add your student work samples, videos, and reflections as well to enhance our website. With new brain research, we now know more of what happens in a brain affected by ADHD. Due to these brain differences, kids with ADHD tend to lose sight of future goals in the distractions of the moment, and they are often unsure about how to accomplish goals they still wish to pursue. Sherry Cramer, an educational therapist, shares some strategies we can use with students with ADHD to support them. Point of performance supports are small changes we can make in a setting or task that can make big differences for kids with ADHD. Such supports might include supplying noise-cancelling headphones, preparing organized work spaces, or providing checklists for complex assignments. Also, the use of rewards and consequences can make a large different since children with ADHD are usually focused on the present moment. Some methods that can be used to help children with ADHD in the long term and outside of the classroom are teaching them to self-manage, using if-then plans, and teaching them executive functioning skills. As teachers we need to make sure we are developing positive relationships with those students who have ADHD, continue to teach them the skills they need, and then give them opportunities to make choices and learn from mistakes. For more specifics on any of these strategies take some time to read the article. 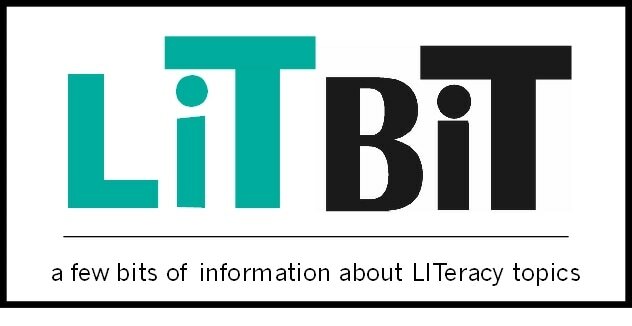 In the April Lit Bit we took a look at a high school Language Arts classroom. 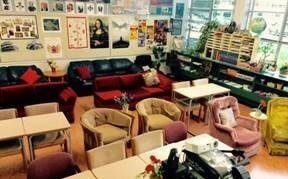 Here is a high school science lab that also has flexible seating for students. 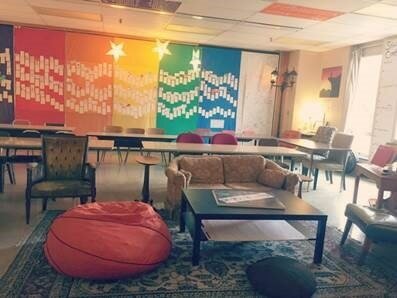 For more information on how this teacher created this classroom and her teaching philosophy, read the blog post. 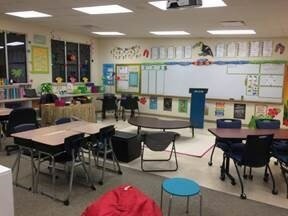 If you are thinking about changing up your classroom next school year to allow for more flexibility, check out the resources and pictures below for inspiration and direction. Interested in some summer reading to inspire your teaching for next year? Check out these two lists of recommended reading for teachers! Please let me know how I can continue to assist you in making your classrooms a place of deep thinking and learning! Rebecca Malmquist also has an affirmation station in the back of her classroom. 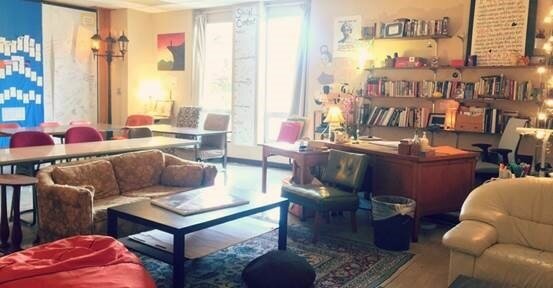 She uses this station to allow her students to send affirmations to each other. Watch this video to see how her students feel about themselves after being in her classroom: https://www.youtube.com/watch?v=YAblJkJsW8I&app=desktop. You can see how this would increase empathy and leadership in our students. Does the activity, strategy, task, or idea allow for the student to personalize his or her response? Can they bring their life experiences into the activity and make it their own? Are there clear and modeled expectations? Is there a sense of audience above and beyond the teacher and the test? Does the activity have value to someone else? Is there social interaction? Do students have an opportunity to talk about the learning and interact? Is there a culture of emotional safety? Are mistakes valued because they are an opportunity to learn? Do students have opportunities to choose within the activity? Is it an authentic activity? This doesn’t mean it always must connect directly to the student’s world, but it should connect to reality. Research shows in classrooms where there was at least three of these characteristics in each assignment, students demonstrated sustained cognitive engagement between 84 and 86 percent of the time. When only two characteristics were present students were only cognitively engaged about 16 percent of the time. At this time of the year when I am trying to fit all the content in that I still have to teach this list will help to narrow down the best activities and assignments that will impact my students’ learning. Please let me know how I can continue to assist you in making your classrooms a place for deep thinking and learning! We all feel the strain at one time or another. We feel that our classes are too large, we have too much to do, and not enough time in class to reach every student. This article points to differentiation being the key to helping us through these difficulties. Many of the strategies we have been highlighting in recent years during our professional development are stated as methods to differentiate and therefore be more effective in the classroom. Transform whole class instruction into small learning teams. Use a variety of structured dialogue prtocols to focus learning expereinces. Focus students on deeper learning/thinking. ​Plan activities based on the levels and interests of the students you have in the classroom currently. If you are interested in improving the discourse within partner/group work in your classroom, take 6 minutes to watch this video. The video highlights an elementary school in England that focuses on oracy in the classroom. 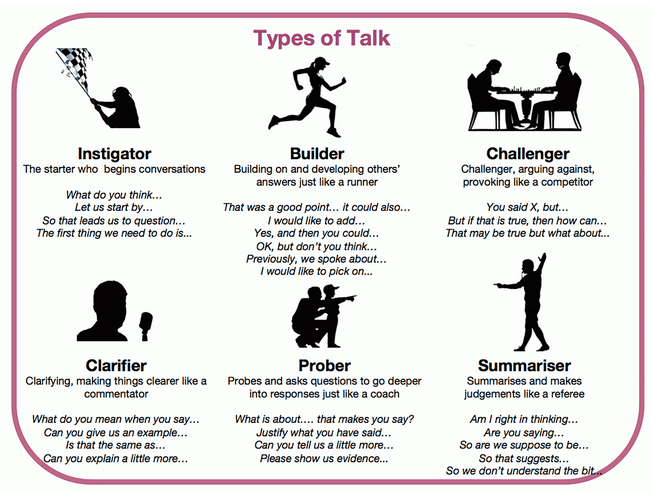 To support oracy, the teachers use discussion guidelines, discussion roles, and choosing the level of participation in structured talk tasks to help each student learn through discussion. You can see examples of each of these below. Always respect each other's ideas. Be prepared to change your mind. Come to a shared agreement. Clarify, challenge, summarize, and build on each other's ideas. Invite someone to contribute by asking a question. Don’t forget about our VIRTUAL PD Opportunity! Join us on Wednesday, January 25th from 2:30 – 3:30 to discuss your results from trying the 8 different wait times listed below. Please sign up in KALPA. She also states that Robert Stahl (1990) identified eight categories of wait time. 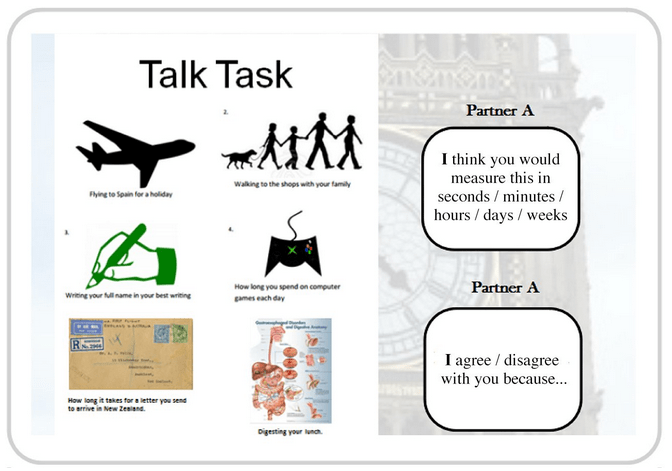 Student task completion work time - pause time intended to allow students to complete an academic task that demands undivided attention. Impact pause time - the use of pause time to create impact or drama. I’m going to focus on each of these eight wait times each week for the rest of the quarter. I challenge you to try each wait time along with me. For a VIRTUAL PD hour, write a reflection after each week and join us on Wednesday, January 25th from 2:30 – 3:30 to discuss your results. Please print the attachment to remind yourself of the schedule and why each wait time is important. With these reflective questions “students have the chance to put themselves back at the center of the learning process.” Try one this week; you may be surprised by the learning your students demonstrate. What surprised you today, and why? What’s the most important thing you learned today? Why do you think so? What do you want to learn more about, and why? When were you the most creative, and why do you think that is? What made you curious today? How does learning feel different when you’re curious? When were you at your best today, and why? (Assuming we were studying the same thing and you could decide and have access to anything), where would you start tomorrow? Why? What can/should you do with what you know? Ron Ritchhart has constructed this list of things to do every day to create a culture in our classrooms where student thinking is valued. These suggestions each take a short amount of time to implement in the classroom but will make a large impact over an entire school year. 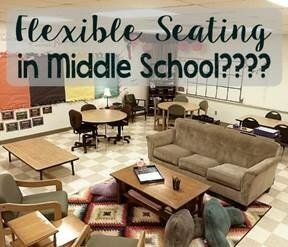 Please let me know how I can continue to assist you in making your classrooms a place for deep thinking and learning! I would love to help you implement some of the new routines or questioning strategies listed above. Edcamp is a form of unconference designed specifically for teachers and their needs. The goal of Edcamp is to bring educators together to share their passion and ideas for better learning in an open format. 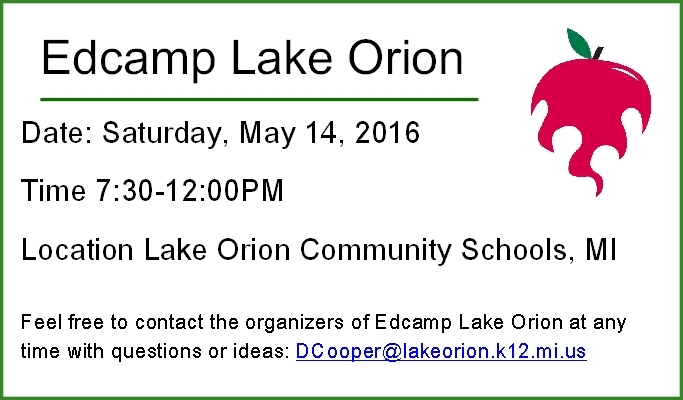 Edcamp Lake Orion is a month away. This PPD opportunity is your chance to learn and discuss educational topics that are important and meaningful to you. Check out these videos to learn more about the Edcamp style and how it can impact your teaching. One of the five belief sets we’ve explored this year is encouraging independence versus dependence. This article from Mindshift highlights many of the essential qualities needed for students to develop intrinsic motivation in the context of reading and writing. 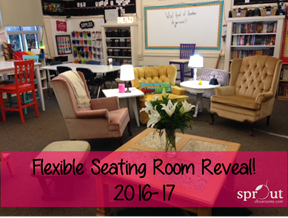 Looking for new ideas to implement in your classroom? Interested in a more differentiated approach to professional development that meets your personal and professional needs? Check out Bloomboard. 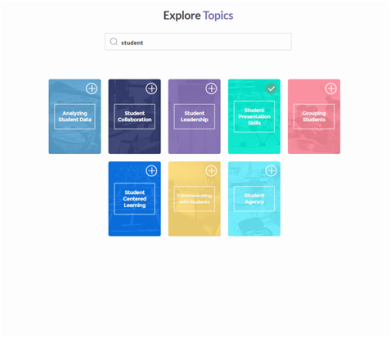 With this learning platform you can explore topics of your interest and investigate curated professional development collections. 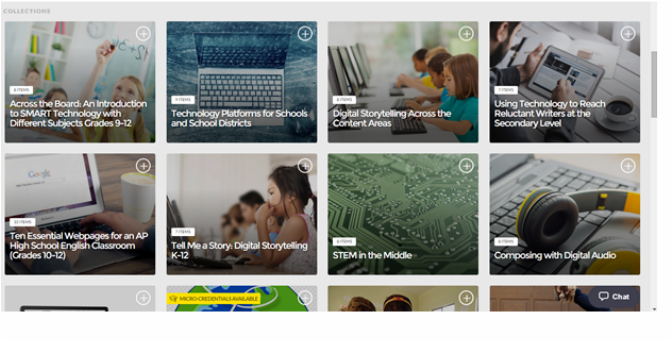 Explore the hundreds of resources available to you. Did I mention it is 100% free?